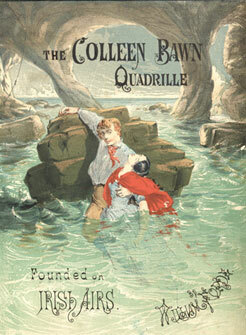 The Colleen Bawn, a dramatic adaptation of Gerald Griffin's novel, "The Collegians" was first produced in the USA, at Laura Keene's Varieties on Broadway, on 29th March 1860. Later that year being performed at the Adelphi Theatre in London it was eventually put on all over the USA and the UK and made its author a fortune, as one of the most popular plays of the century. Melodrama set in Ireland near Lake Killarney. Mrs. Cregan in an attempt to save her family's impoverished estate encourages her son Hardress to wed his cousin Anne Chute for her money. Hardress has secretly married Eily O'Connor, a peasant girl, but still makes advances to Anne to save the estate. Hardress visits Eily, on the other side of the lake, and one night is seen and taken by Anne for her lover Kyrle Daly. Annoyed at Daly's inconstancy and hearing about the Cregans' financial plight, she agrees to marry Hardress. Danny Mann, Hardress's evil servant, decides to murder Eily, afraid she will prevent the marriage with Anne. He pretends to take her across the lake to meet Hardress but as he tries to drown her is himself shot by Myles na-Coppaleen, a former lover of Eily. Meanwhile, interrupting the wedding of Hardress and Anne police officers accompanied by the dying Danny turn up; Danny falsely accuses Hardress of killing Eily, who promptly appears. Myles had hidden her after rescuing her. In the end, Mrs. Cregan welcomes Eily into the family, Anne and Kyrle are reconciled, and Anne saves the Cregan estate by paying off the debt. The play was written by Boucicault in 1860 for Laura Keene's company. She played the heiress Anne Chute. Boucicault played Myles-na-Coppaleen, and his wife Agnes, Eily O'Connor. The production at the Adelphi ran for a record 231 performances. The cast included C. H. Stephenson, Edmund Falconer, Miss Woolgar, and Mr. and Mrs. Billington. "The production was also of considerable significance for writers for the theatre. Boucicault pioneered a royalty system by making a "novel proposal" to Webster, the manager, for The Colleen Bawn. Instead of asking for a lump sum, he suggested sharing terms--and found himself eventually richer by 10,000 pounds.... The practice did not become universal until the 1880s" (History of English Drama, 5: 69). The Observer of 16 September 1860 praised the set, particularly the lake where Eily's attempted drowning took place.